While Microsoft Project Siena is still in beta (and I hope that some missing functionality and enhancements will arrive when it reaches GA), I decided to take some time to create an app to publish to the Windows Store. 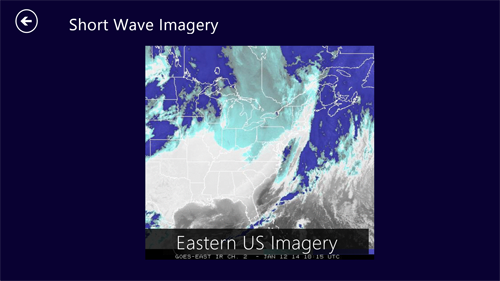 I’ve always followed the latest GOES satellite maps from NOAA, but have not yet found a Windows Store App that displays this information. I realized that using the same functionality I used to build my Barb Bowman Photography App (I’ve submitted that to the store now as well), I could quickly build exactly what I wanted. 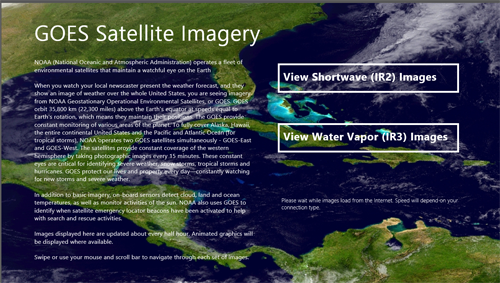 So I created my GOES Satellite Imagery App. Basically this app displays the satellite images (that change about every 30 minutes or so) and includes animations when available. Instructions for converting a Siena app to a Visual Studio Project are available from MSDN. I made a few detours from the supplied instructions and opened the processed app in VS2013 even though the instructions state NOT to do this and specify VS2012. I suspect that this is to prevent people from trying to target Windows 8.1 which Project Siena does not support. (I hope this changes in the future, but for now, targeting 8.0 is fine since the app will run on both versions). I checked the package.appmanifest and removed all the items from the Capabilities tab except Internet (Client) since my app does not need or use the other items that were checked by default. I designed a different set of visual png files to be used for the Splash Screen, Store logo, Wide Logo etc. and imported them into the images folder inside the project (right click the folder, Add, existing item) and then changed the entries on the Visual Assets tab in the appmanifest accordingly. Because the Project Siena generated app has no support for Portrait mode (I hope this is coming soon), on the Application tab, I checked both landscape items but NOT the portrait items. 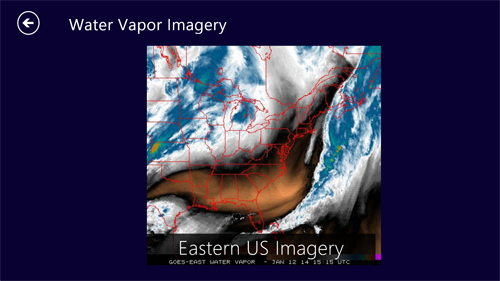 My GOES Satellite Imagery app is free and available in the Windows Store for US, CA, UK, and AU. Take a look and tell what you think on Twitter @barbbowman.